Steeped in history and mythology – Udupi is a coastal town quite popular for it’s beaches and temples, blessed with beautiful palm-fringed beaches that beckon even the most discerning traveler to kick off their shoes. Join us as we walk on the sandy shores, visit temples to get on a spiritual high and for a dose of laid-back lifestyle for lazy beach bums. We’ve rounded up the top places to see in Udupi in a day. Udupi is primarily a pilgrimage spot. The most famous of all the temples is the Sri Krishna temple. The temple is dedicated to Lord Krishna who is worshiped through a small exquisitely carved window with nine holes called the Navagraha kindi. There is also a Krishna matha that was founded by the Vaishnavite saint Shri Madhwacharya in the 13th century. Expect a long queue of devotees during evenings or weekends. But don’t get disheartened, this temple is worth a visit. 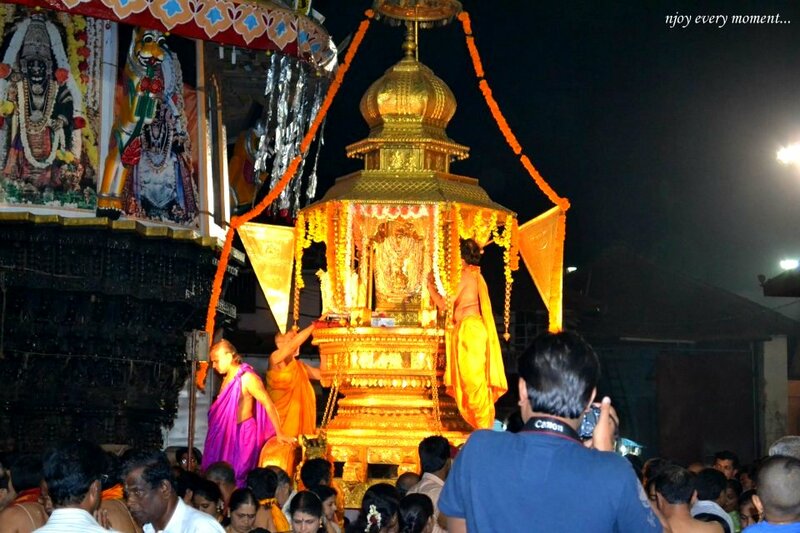 Do read more about the interesting story that is associated with the temple in the link below. Just a little detour will land you to one of the most beautiful beaches of Udupi. One side of the beach is dotted with fishing boats while another side there is a soaring lighthouse that offers breathtaking views of the coastline and the ocean. If possible, try to visit during sunrise or sunset. You can sit and watch the waves breaking on the sandy shores and enjoy the well deserved secluded bliss. St. Mary’s island is a tiny island, just a 30-minute ferry ride from the port. Legend has it that Vasco da Gama reached this island first before heading towards south. The island is covered with vertical basalt which was formed due to a volcanic eruption and dates back to the time when Madagascar was attached to India. Similar basalt rock formation can be found in Madagascar as well. The surreal sunset and waves crashing on the rock formation make it a picture perfect location. Don’t miss to hop on a ferry to this gorgeous island. Ferry runs every day from 9 AM until 4 PM, the last ferry that returns from the island is at 5:30 PM. Malpe Beach is one of the most sought after beaches of Udupi. Dotted with swaying palm trees and lined with street vendors. No doubt it is is one of the most visited and crowded ones. You can delve into street food, just laze around and watch the sun set or frolic with kids. The temple dates back to the seventh or eighth century AD. Legend has it that Lord Chandra (moon) was cursed by Daksha Parjaapati and did penance at this spot to appease Lord Shiva. The detailed stone carvings and interiors make the temple unique and showcase the expertise of highly skilled architect involved in building the temple. In the inscriptions, the Chandramouleshwara temples have been referred to as “Mududeva”. Apart from our top five places, Udupi has many other attractions to offer. You can check out Airbnb, Oyo Rooms or MyIndianStay for budget options. By Road: Overnight buses ply from Bangalore and takes around 8 hours. Udupi is a perfect getaway from Mangalore, Bangalore, Cochin, Hubli, Hyderabad. Follow us on Facebook | Twitter | Instagram | Pinterest | Youtube | Google+ for more travel stories, idea, and photos from around the world. Nice info. I will be visiting soon and this helps. Thanks. Glad this is of help Arun and thank you. I am from Udupi.. and I felt so proud about my place when I read your post.. Very nicely written..
Stoked to know such lovely beaches exist so close to me! Thanks for writing this! interesting town I say…and i only udipi for the ‘udipi’ restaurants!!! Beautiful pictures and you have summed them all. Although Udupi has more places which are not so famous but they are worth the visit. Awesome photos. Thanks for the informative post. Lovely pictures and nice read! I have been wanting to go to Udipi forever! Home town for me :D. My wedding reception was here. I personally love Kaup beach . I have gone beyond it but not explored Udapi. Looks like a beautiful place! Mridula next time you are in Bangalore, we can plan a road trip to Udupi… what say ? 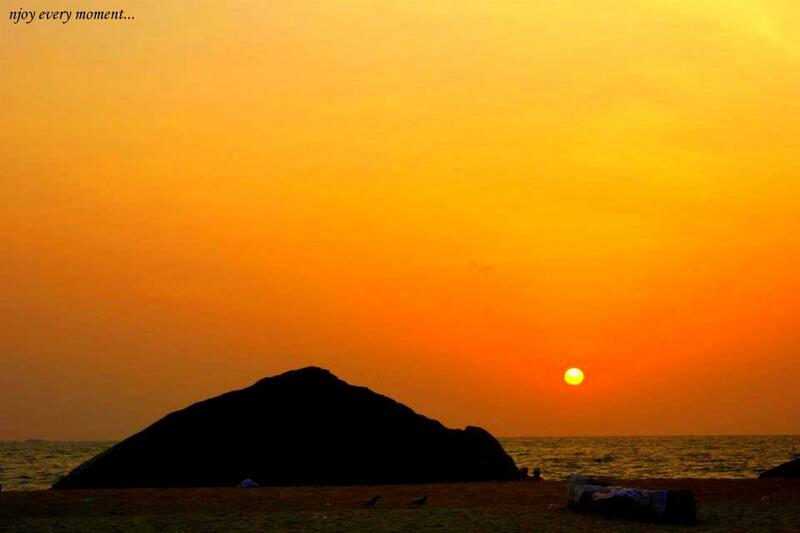 Malpe beach is my favorite and you have captured it brilliantly! Nice list of place to explore near Udupi. I was really curious as to where in the world Udupi was located when I first started reading your post, so looked it up on Google and found that it was in India. Then I noticed that at the end you have provided a how-to on getting there so found that information very useful. Such a beautiful place and so many interesting things to see. Really enjoyed reading about your experiences there and the photos are stunning. Beaches, more beaches, and historical and cultural temples! There is just so much to see in INdia, I have no idea where to start, but I guarantee it will be at the beach. And a moon cursed temple is top of my list, too. The first photo of St Mary’s Island is unreal! It looks like it could be a painting or something! I stayed at a coastal area in Karnataka en route from Kerala to Goa but can’t for the life of me remember what it was called! It was absolutely beautiful though, I don’t think India gets enough credit when it comes to beaches and ocean views. In fact it probably has some of the best in the world. Love all the resources and tips, especially about the temples. St. Mary’s island looks heavenly! I had to look up where Udupi was. Had no idea it was in India! What a great place to visit, I will have to add this one to my bucket list! Udupi is another place you guys have introduced me to that seems fantastic. The beaches look surreal, well photographed! I’d definitely make the 30 minute ferry trip to St Mary’s Island. Am I crazy for never having heard of Udupi? I had to google it to figure out where it is. The palm trees on Malpe beach look amazing… I’d love to photograph them! Udupi sure looks beautiful. I have yet to visit India but a friend of mine is going next month and he is beyond excited about it. One day I’ll make the trip myself. Stunning views! And equally stunning photographs! What camera did you use to take these? Love the sunset shot the most! Very informative guide on Udupi and I liked your sunset picture a lot. I would really love to go Malpe Beach and love to see most of the temples mentioned in your post. Good to know that St. Mary’s Island is famous for Vasco De Gama’s Landing place.